I was a labourer at the clay end of Grindley’s, moving trucks of ware to place in the biscuit kiln, and taking away scraps of clay to the sliphouse. My feet would bleed as I pushed the trucks up and down. I worked seven days a week – I even worked over Eid, the Muslim festival that marks the end of Ramadan. The manager asked me to come in. He said ‘A lot of Muslims are having the day off – will you work?’ I agreed to do it. I said my prayers – and went back on the job. I always wanted overtime. The manager would say ‘Rahim – there’s overtime going – d’you want it?’ and I always did. I would work twelve hours a day, plus Saturday and Sunday. 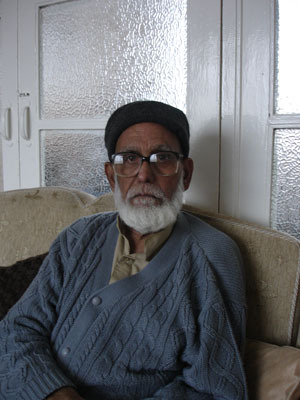 I came to the UK from Pakistan in 1964. Initially I went to Bradford, but my brother-in-law was working in Stoke, so I came here in 1966. We were a close-knit community and there were a lot of Asian people at Grindley’s. Once I came here I didn’t look back. I threw myself into work and I gave it one hundred percent -- everything I had. It was heavy work, and the time came when I couldn’t do it any more. I have given my life to this country, but I am happy -- now I am getting it back. I have a pension. I have two children and they have both studied and are doing well.